Gourds are among the oldest of cultivated plants, dating back to 2200 B.C. They were commonly preserved and used as containers or carved into scoops. 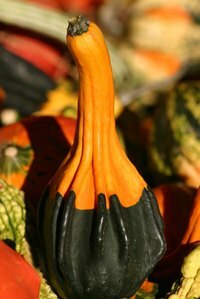 Gourds today are grown in a variety of types and sizes from small ornamental gourds to large birdhouse gourds. When correctly harvested and preserved, gourds dry out to be used in art and craft designs using different techniques such as carving, wood burning or painting. Cut the gourds from the vine when their stems dry up and turn brown. At this stage they are mature and will be preserved successfully. Wash the gourds in warm soapy water. Use a soft washcloth to wipe away dirt; be careful to not nick the gourd’s surface or it will decay. Rinse the gourds in a solution of 2 quarts warm water and 1/4 cup borax. This works as a disinfectant and kills any germs or pests that promote decay. Dry each gourd thoroughly with a soft bath towel and lay them on newspaper in a dry, warm, dark place such as an attic, shed, barn or unused room. Make sure there is space between the gourds to keep them from touching each other. Allow the gourds to dry, turning them over every few days. You many notice some mold developing on the surface from the water leaving the gourd which is normal. Discard any gourds that become mushy or begin to cave in on themselves. It takes one to six months for a gourd to dry depending on the size and atmospheric conditions. When they are dry, they will be a tan color and make a hollow sound when tapped. You can also hear the seeds moving around when shaken. Wash the dry gourds in warm soapy water scrubbing away dust and mildewed skin. Tough areas can be sanded with fine grain sandpaper. Large gourds dry well while hanging. Tie twine or heavy string around the stems and hang from rafters or a drying rack. Store-bought gourds are often waxed or varnished to keep them fresh for display. These will not usually dry properly because the wax, or varnish, prevents water from leaving the gourd.